Let's face it, weddings and corporate events can be massively wasteful. But your floral shop doesn't have to be. In fact, in the upper left corner of this country, it's a selling point to operate a greener floral studio with sustainable products and techniques. Our clients seek out ways to live more responsibly and love knowing that their decor isn't unnecessarily wasteful. We gauge wastefulness by weighing the material’s life cycle. Start of life, during life, and after life. So with this in mind, something like bioboard is less wasteful than styrofoam or foamcore. Floral Soil is less wasteful (if at all) than floral foam. At the start of life, how was the material created and what pollutants and general yuckies were created by its production? Was it grown? Super. Was it grown locally without chemicals and practices that might pollute waterways and harm insects? Super Duper!!! Was it made from previously recycled content? Love that. How was it shipped? During it’s life in our studio, how many times can we reuse it? Can we make it into a quality, long-lived piece that our clients will want to keep? Does it give me a mysterious rash? Can my dog eat it? When we are done with it, where does it go? Can it be recycled? Can it be composted? Can we rent it out again? Now I’ll admit there is a stockpile of adhesives and paints in our studio that are nowhere near Super Duper, Gold Star Life Cycle Rating, but we do what we can where we can and are always on the lookout for materials that better fit our goals. Here are a few materials you can be confident in and start using immediately that won’t raise eyebrows. Originally made for printing, this stuff comes in 1/4" to 1" thickness and 4x8 foot sheets. It's extremely light and strong. We use this in place of foam-core, styro sheets, masonite, and even somtimes wood. Don't get water on it though, because it will dissolve fast. We use this to build scenes, 3D shapes, and support for floral walls. Currently ramping up production is floral soil solutions, a water-holding, bio-based compound that will replace toxic floral foam. Get on the list to get your own stash and experiment with how it works. Including tall arrangements that were one so improbable in a studio without foam. It can be reused for a time, then tossed into your compost nary a concern. Find it here. So versatile, seriously. 'Le Stick' is practically used everyday in our studio to create volume and transport- proof armature in which to stick our stems, even in low, wide arrangements, a tape grid and a stick armature is all your need to create a secure centerpiece with lots of volume. Nature's natural sponge that holds moisture for days. 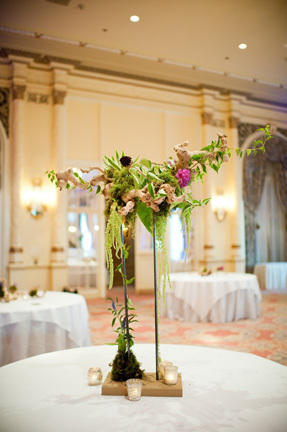 Use a matrix for holding stems in place over an opaque container or mass into a ball for a natural sculpture. Both uses eliminate the need for floral foam. They're not just prettier but they haven't traveled long distances., Local allows you to have a greater knowledge of how your flowers were raised and supports local business. With the right growers, you can work together to ensure you are getting all those great, strange flowers that are extra special. Nothing conveys specialness than pointing out a flower and telling them about the person who grew it for them. Thats just love and speicalness all over the place. If you know someone who would find this helpful, please send it to them!